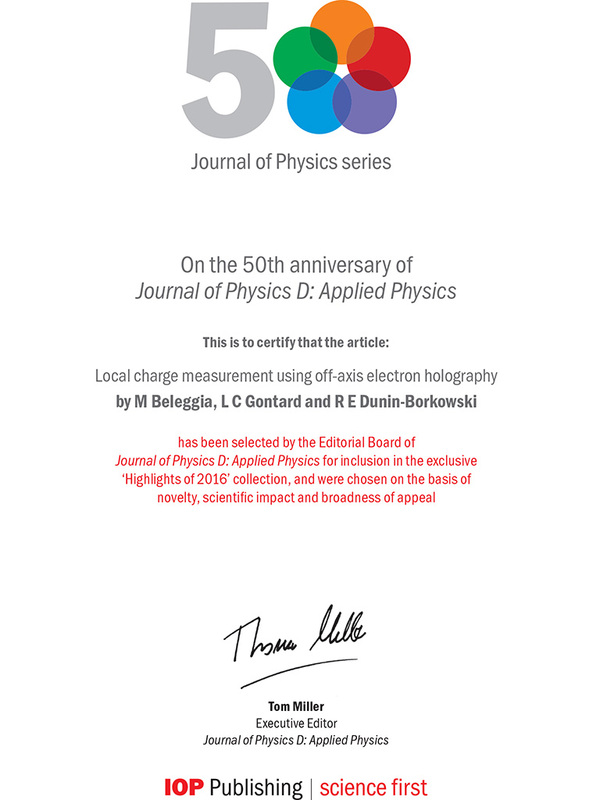 Local charge measurement using off-axis electron holography. J. Phys. D: Appl. Phys. 49 (2016), 294003. 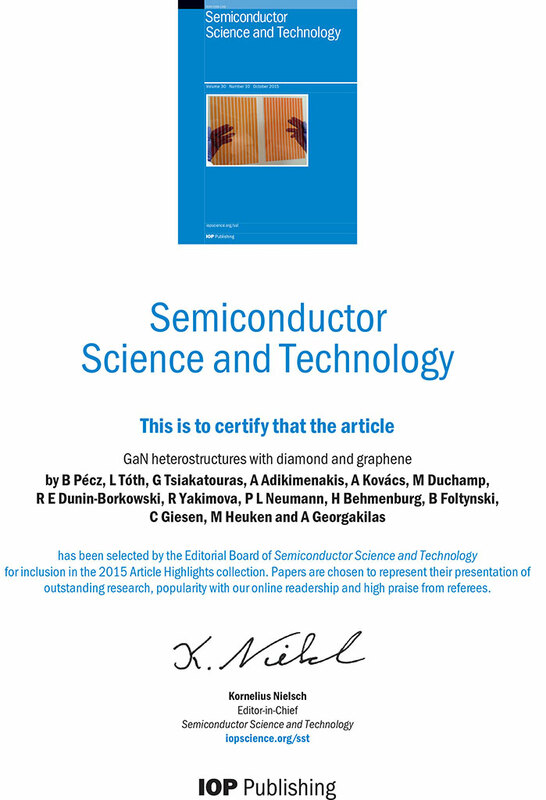 GaN heterostructures with diamond and graphene. Semicond. Sci. Technol. 30 (2015), 114001. 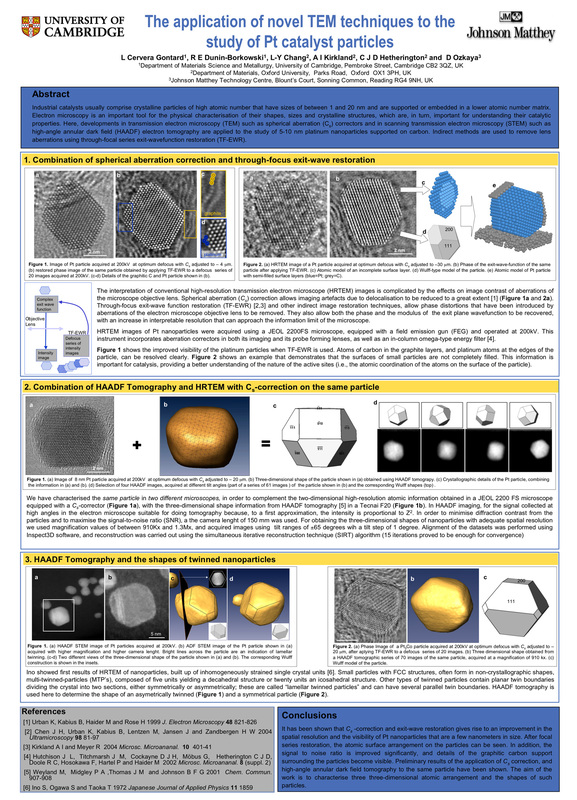 2014 EMS (European Microscopy Society) Outstanding Paper Award in the category "Materials Sciences". Polarity-driven polytypic branching in Cu-based quaternary chalcogenide nanostructures. ACS Nano 8 (2014), 2290-2301. 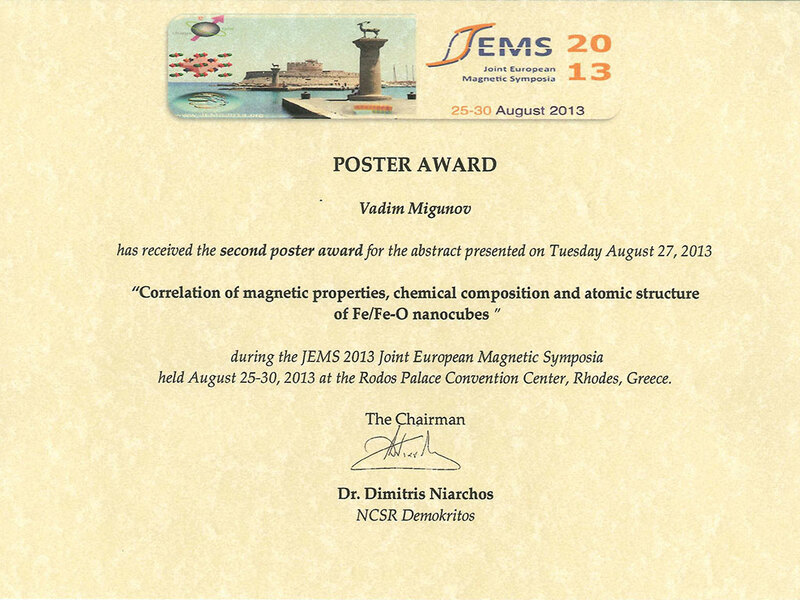 Poster prize at the Joint European Magnetic Symposia, Rhodes, Greece, 25-30 Aug 2013. Correlation of magnetic properties, chemical compostition and atomic structure of Fe/Fe-O nanocubes. 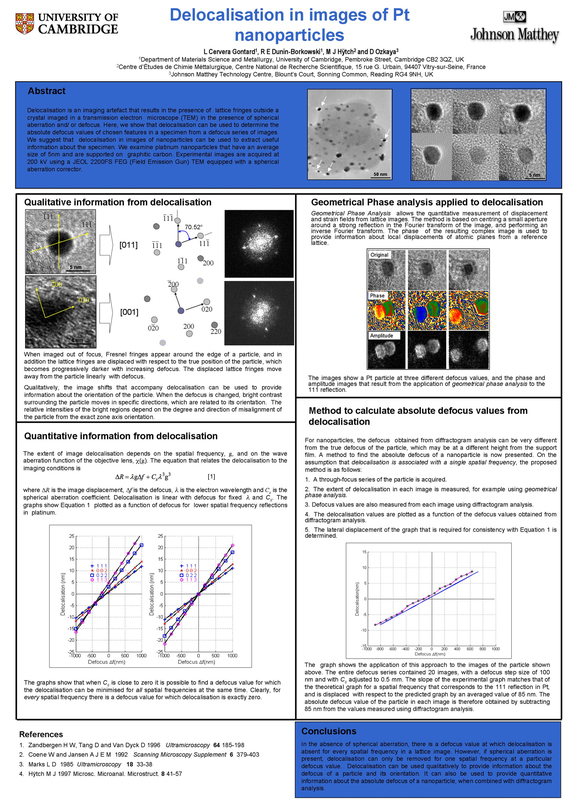 Poster prize at Microscopy and Microanalysis, Indianapolis, IN, 4-8 Aug 2013. 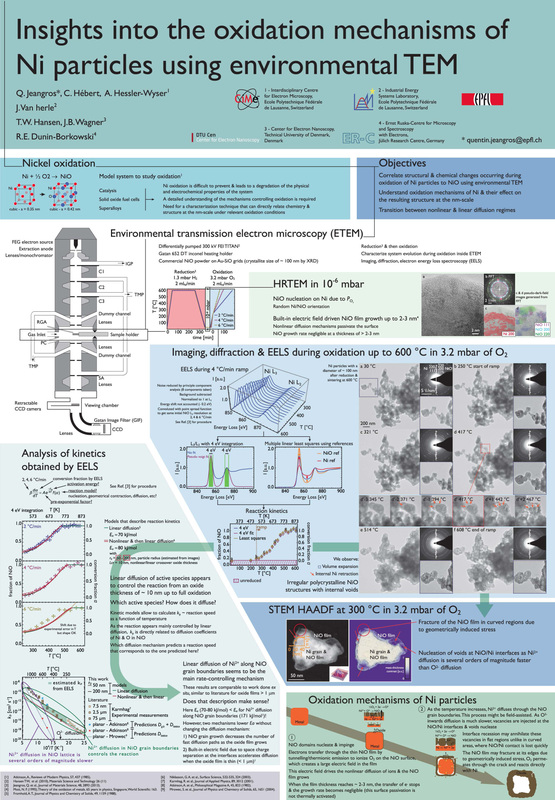 Insights into the oxidation mechanisms of Ni particles using environmental TEM. 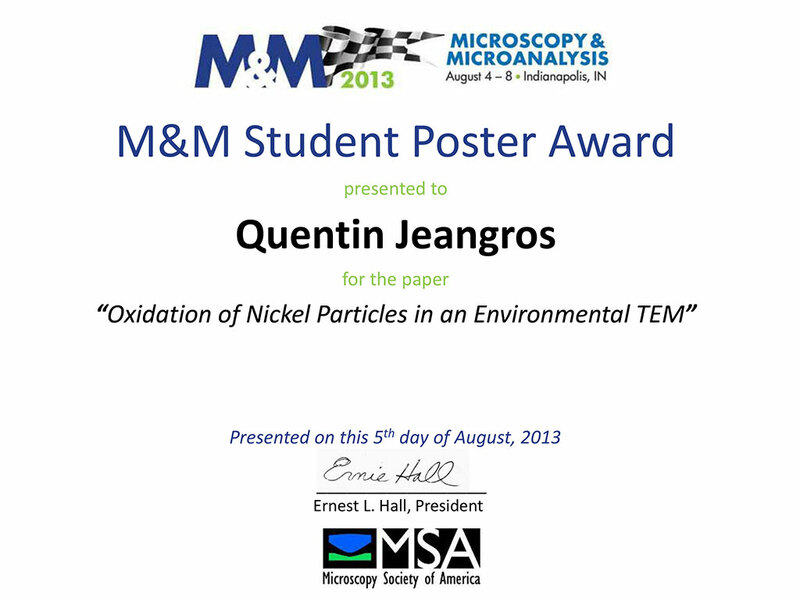 Postdoctoral paper prize at Microscopy and Microanalysis, Indianapolis, IN, 4-8 Aug 2013. Towards mapping electrostatic potentials in semiconductor devices under working conditions using off-axis electron holography. 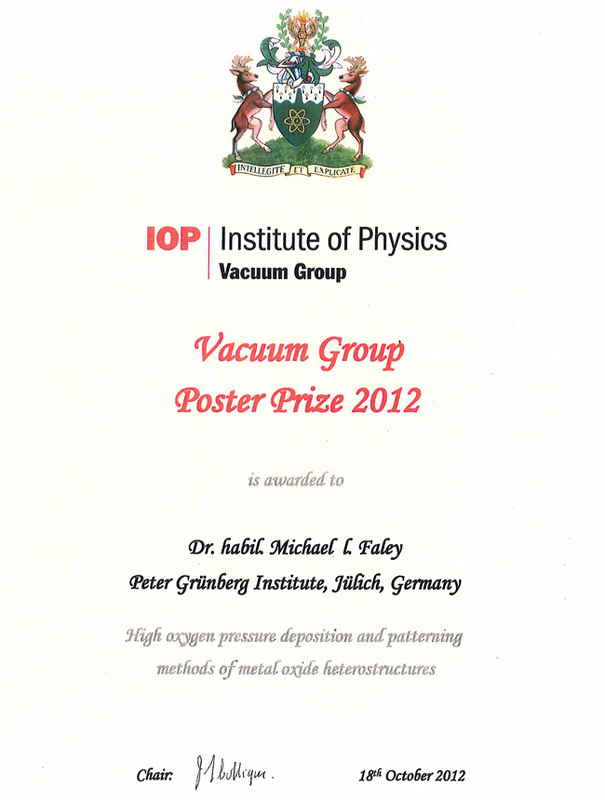 Institute of Physics Vacuum Group poster prize at the 3rd Vacuum Symposium, Coventry, U.K., 17-18 October 2012. High oxygen pressure deposition and patterning methods of metal oxide heterostructures. 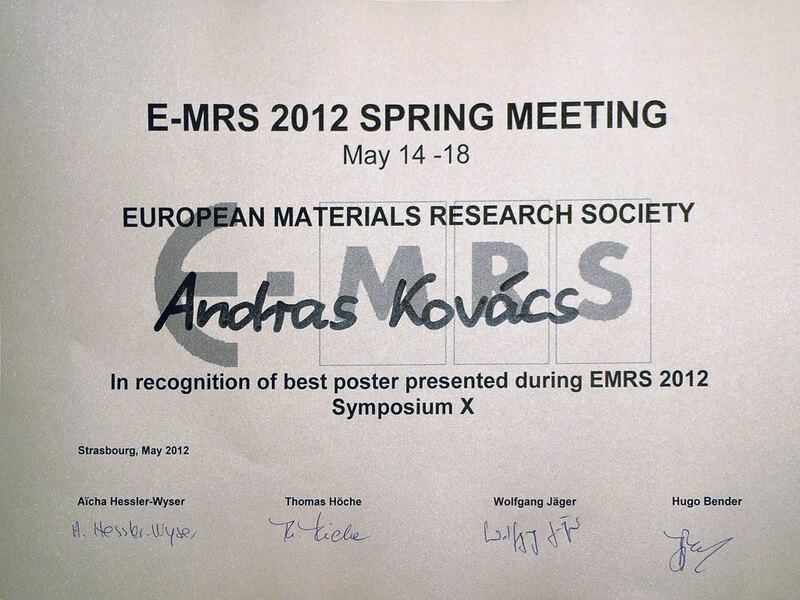 Poster prize at the E-MRS Meeting, Strasbourg, France, 14-18 May 2012. 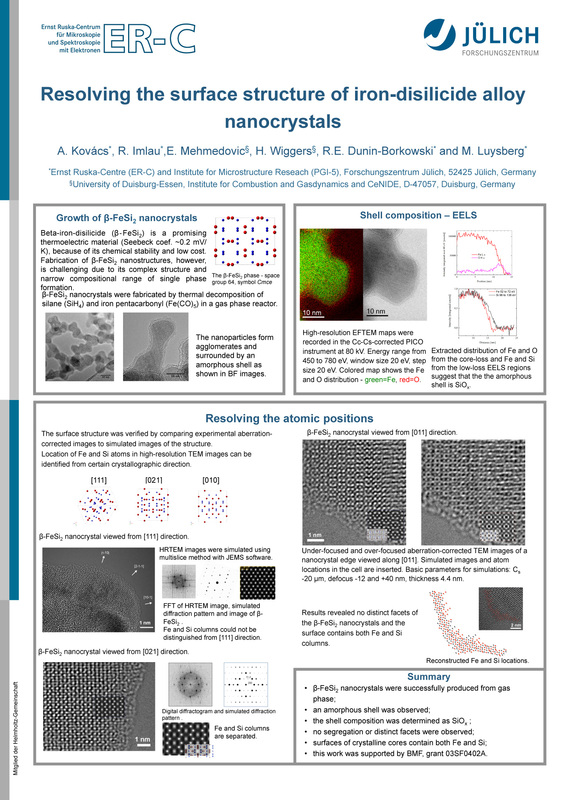 Resolving the surface structure of iron-disilicide alloy nanocrystals. 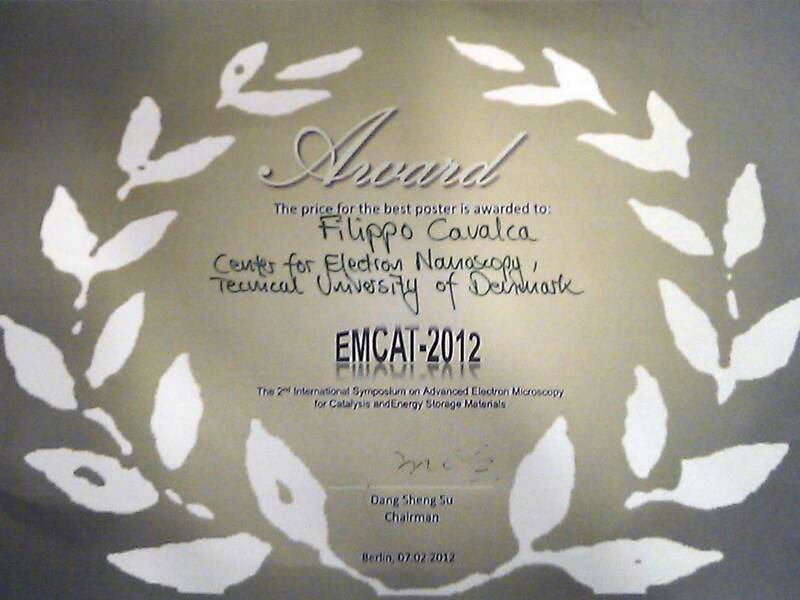 Poster prize at the 2nd International Symposium on Advanced Electron Microscopy for Catalysis and Energy Storage Materials (EM-Cat-II), Berlin, Germany, 5-8 Feb 2012. 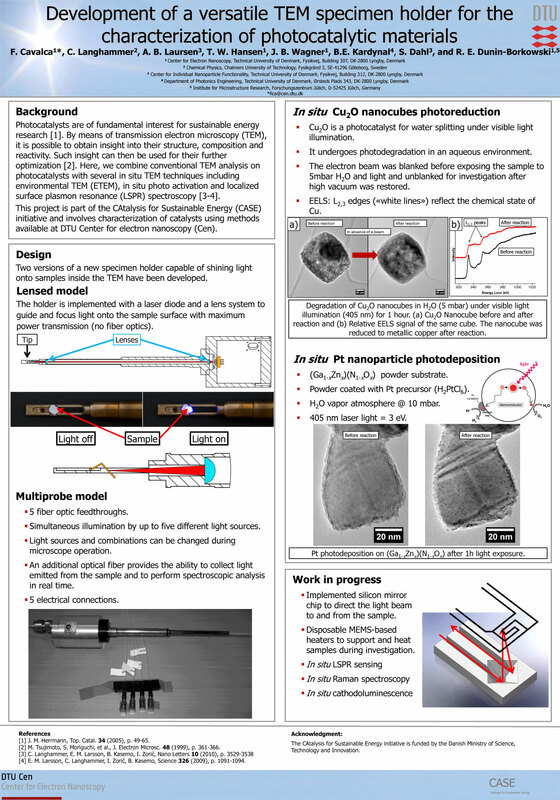 Development of a versatile TEM specimen holder for the characterization of photocatalytic materials. 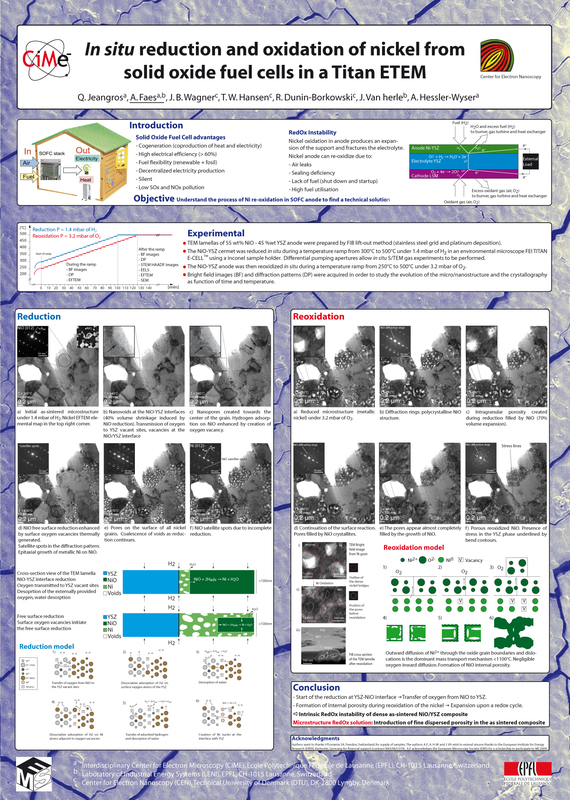 Poster prize at the Microscopy Conference 2009, Graz, Austria, 30 Aug - 4 Sep 2009. In situ reduction and oxidation of nickel from solid oxide fuel cells in a Titan ETEM. 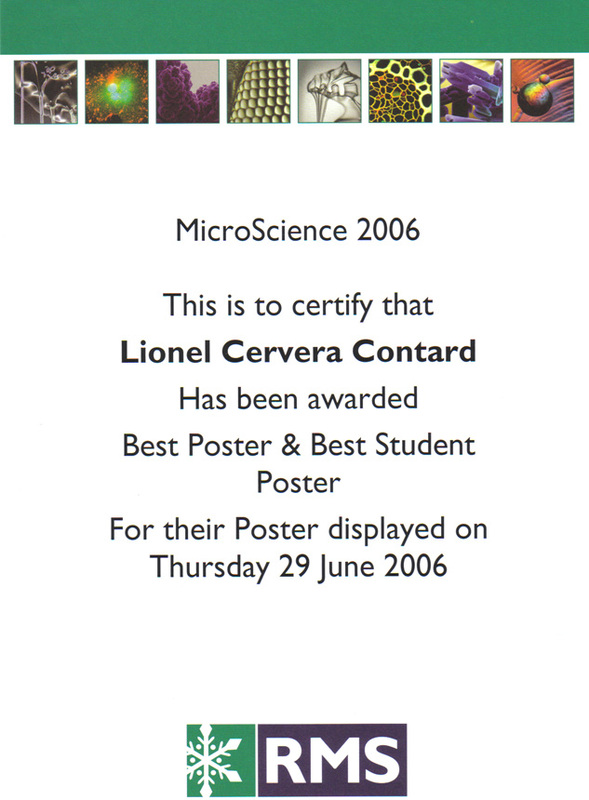 Best poster prize and best student poster prize at Microscience, London, 27-29 Jun 2006. The application of novel TEM techniques to the study of Pt catalyst particles. 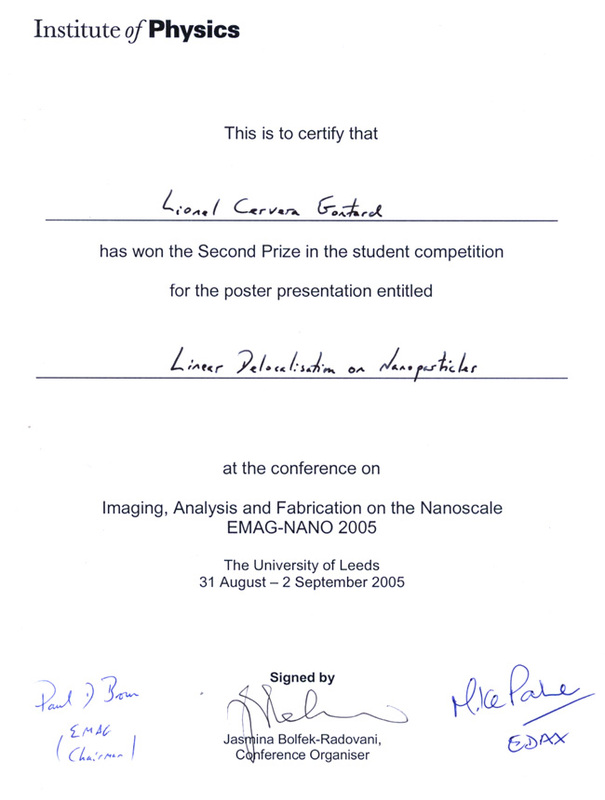 Poster prize at EMAG-NANO 05, Leeds, 31 August - 2 September 2005. Delocalisation in images of Pt nanoparticles. 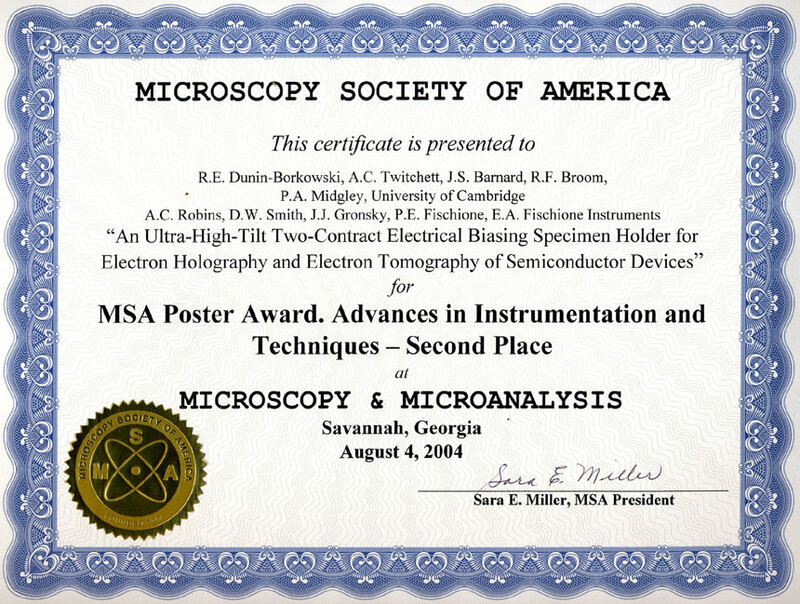 Poster prize at Microscopy and Microanalysis, Savannah, Georgia, 1-5 August 2004. 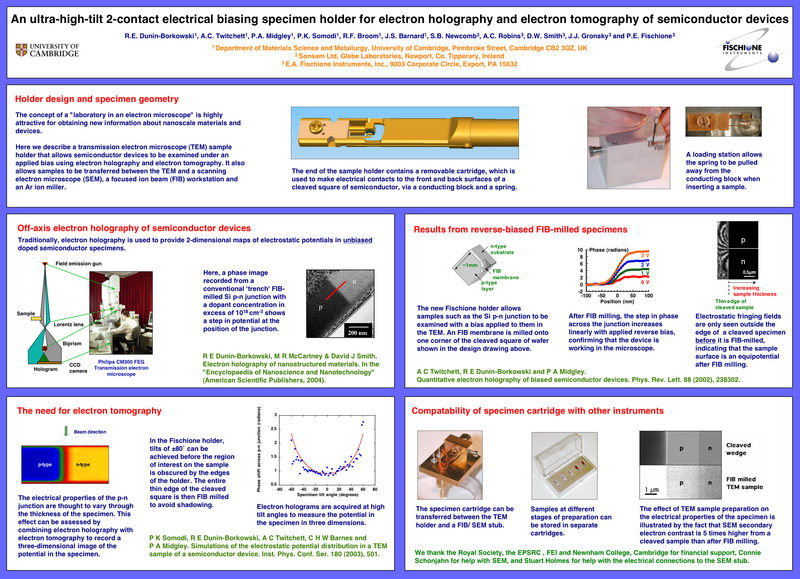 An ultra-high-tilt two-contact electrical biasing specimen holder for electron holography and electron tomography of semiconductor devices. 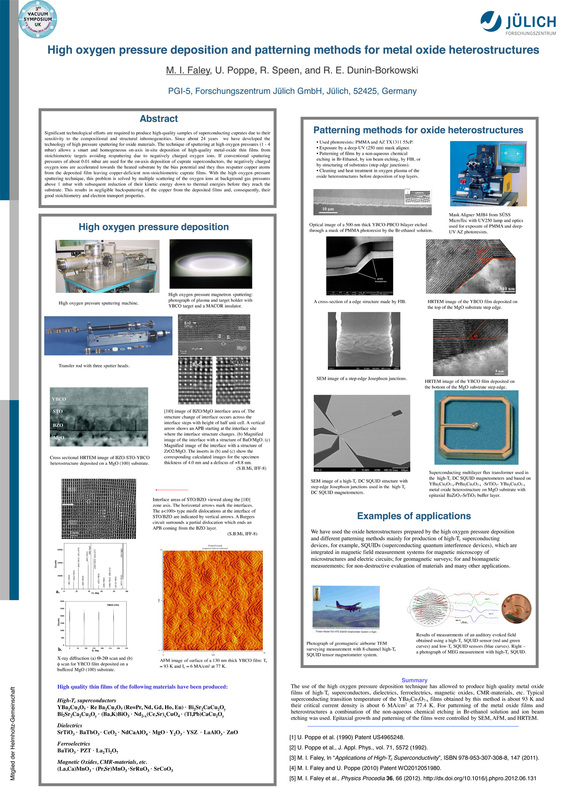 Click here to download, in pdf format, the paper that was presented with this poster. 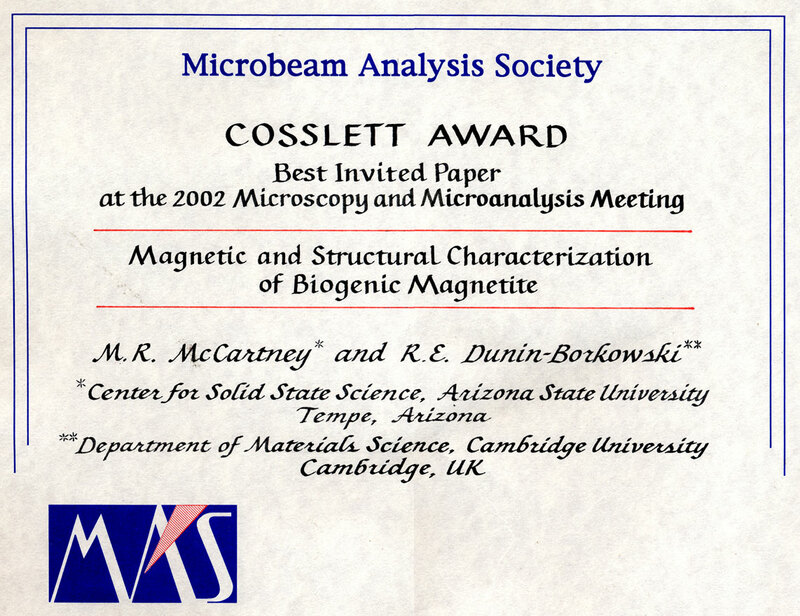 Best invited paper at Microscopy and Microanalysis, Quebec City, Canada, 4-8 August 2002. Magnetic and structural characterization of biogenic magnetite. 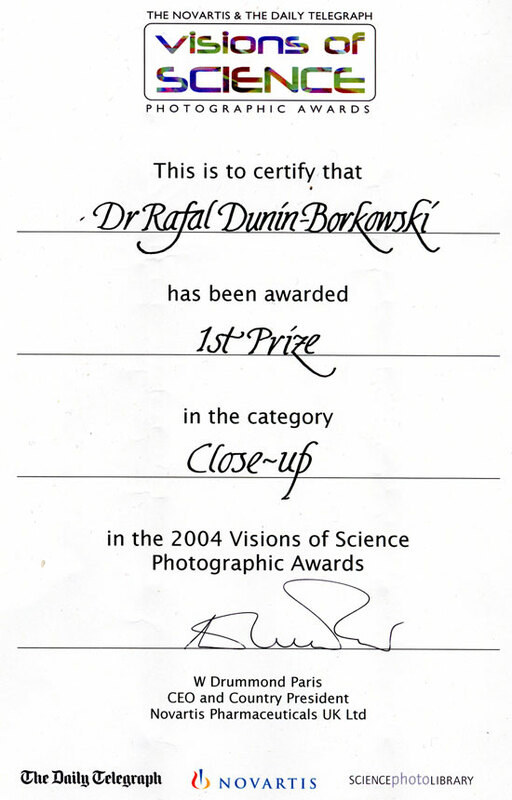 Poster prize at Microscopy and Microanalysis, Philadelphia, Pennsylvania, 13-17 August 2000. Microstructure and thermal conductivity of AlN(Y2O3) ceramics. Poster prize at the Condensed Matter and Materials Physics Meeting, Warwick, 19-21 December 1994. Energy filtered Fresnel contrast analysis of Fe/Cu multilayers. Student paper prize at the Microscopy of Semiconducting Materials Meeting, Oxford, 5-8 April 1993. The characterisation of delta doping by Fresnel contrast analysis. 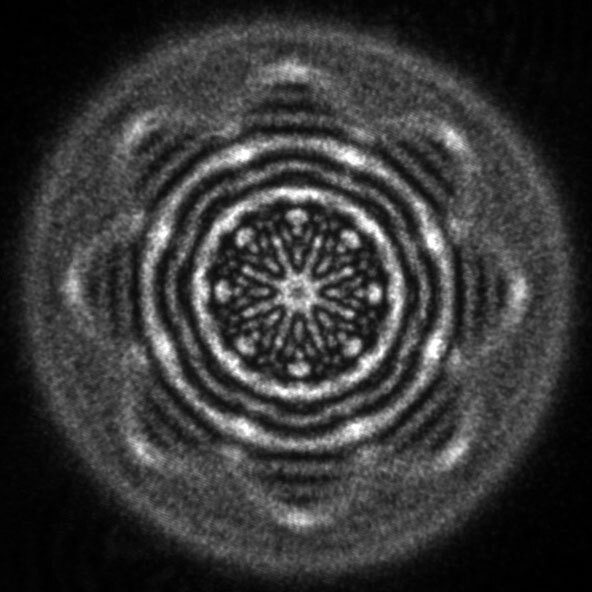 First prize in the Electron Microscopy - Materials Science category of the Royal Microscopical Society Scientific Imaging Competition for an entry entitled "Shaped electron wavefunction". The image shows the zeroth order diffracted intensity of a structured electron beam generated using a focused-ion-beam-prepared holographic aperture comprising a superposition of two Laguerre-Gaussian states with quantum numbers L and p of (4,4) and (-4,2), respectively. 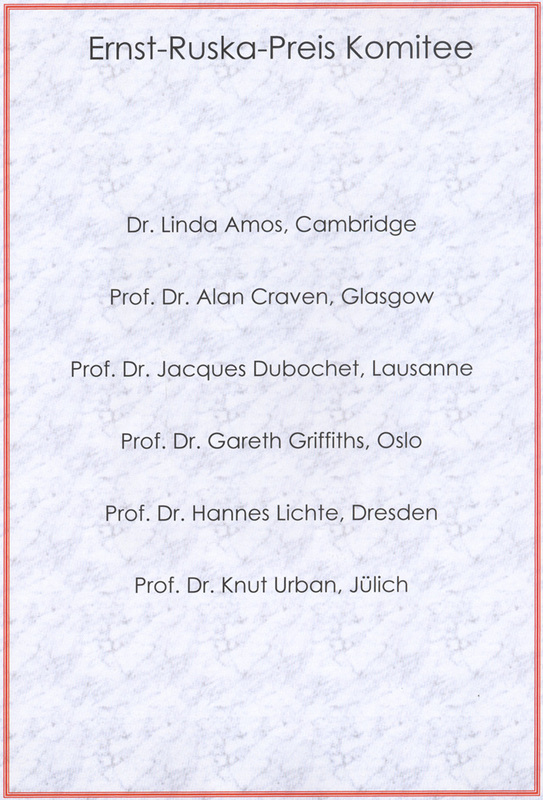 Acknowledgments: Amir Tavabi, Federico Venturi, Gian-Carlo Gazzadi, Penghan Lu, Steffano Frabboni, Ebrahim Karimi, Vincenzo Grillo, Rafal Dunin-Borkowski. 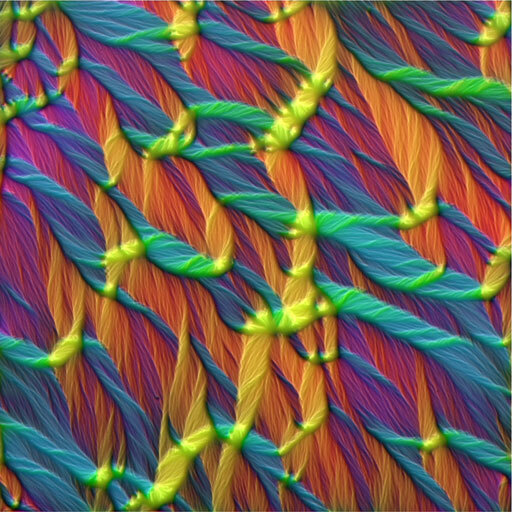 First Prize in the "Science as Art" category in the Daily Telegraph Visions of Science competition, for a micrograph entitled "Magnetic field changes in a thin cobalt film". 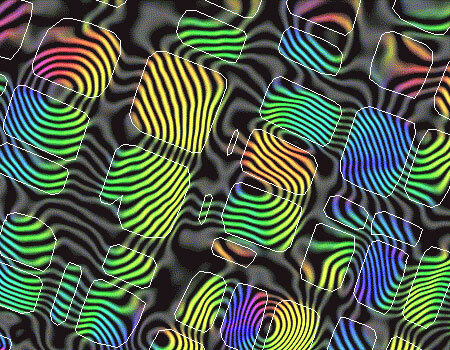 The colors in the image show the different directions of the magnetic field in a layer of polycrystalline cobalt that has a thickness of 20nm.The field of view is approximately 200 �m.The image was acquired using the Fresnel mode of Lorentz microscopy in a Philips CM200 field emission gun transmission electron microscope.It was converted to a color induction map by applying the Transport of Intensity Equation to the image intensity. Acknowledgments: Anke Husmann (Toshiba Cambridge Research Laboratory), Molly McCartney, Chris Boothroyd. 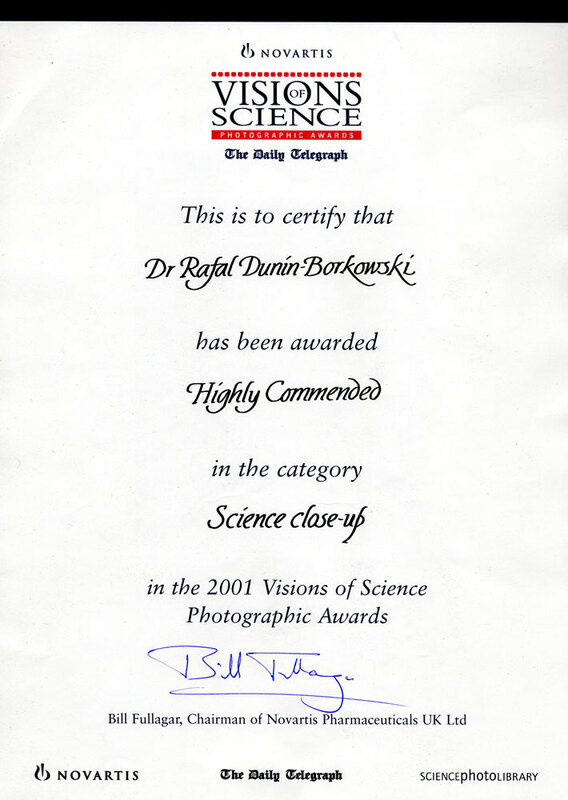 First Prize in the "Science Close-Up" category in the Daily Telegraph Visions of Science competition, for a micrograph entitled "The magnetic field of an iron crystal inside a carbon nanotube". 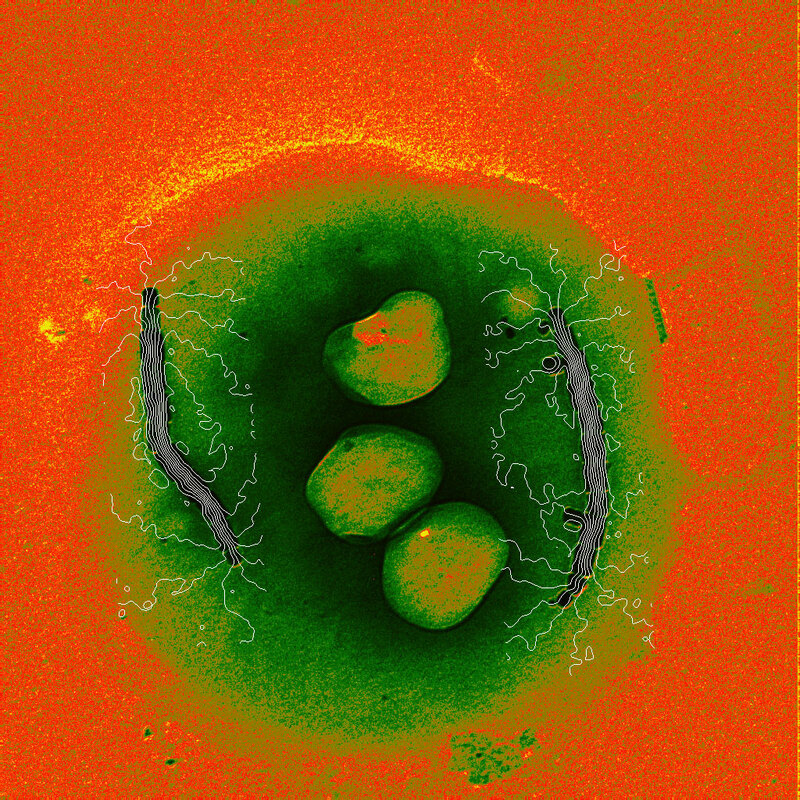 The image shows a multi-walled carbon nanotube, approximately 190nm in diameter, containing a 35-nm-diameter iron crystal encapsulated inside it.Electron holography has been used to obtain a map of the magnetic field surrounding the iron particle, at a spatial resolution of approximately 5nm.The magnetic phase contours show that the particle contains a single magnetic domain.An external magnetic field could be applied to such particles to exert a torque on the surrounding nanotube. Acknowledgments: Takeshi Kasama, Krzysztof Koziol, Alan Windle. 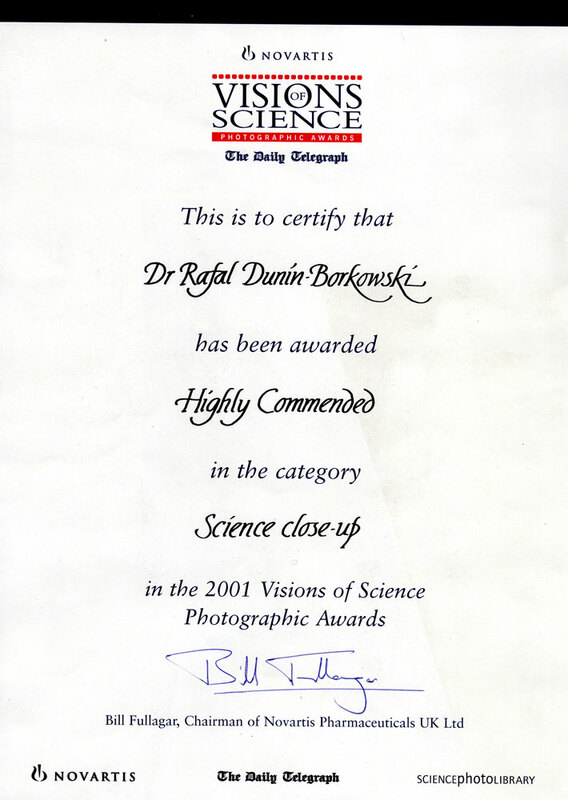 Highly commended entry in the "Science Close-Up" category in the 2002 Daily Telegraph Visions of Science competition, for a micrograph entitled "Magnetic rock". The image shows the magnetic microstructure in a natural, finely exsolved intergrowth of magnetite blocks in an ulvospinel matrix,which is influenced both by the shapes of the individual magnetite blocks and by magnetostatic interactions between them.Different colours correspond to different directions of magnetic induction in the sample. Click here to download, in pdf format, the paper from which this image was taken. Acknowledgments: Richard Harrison, Andrew Putnis. 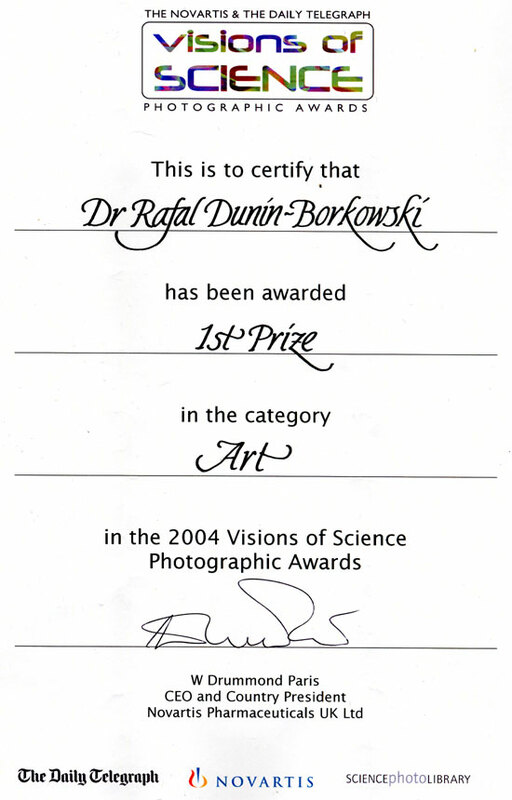 Highly commended entry in the "Science Close-Up" category in the 2001 Daily Telegraph Visions of Science competition, for a micrograph entitled "Magnetic field lines in a bacterial cell". 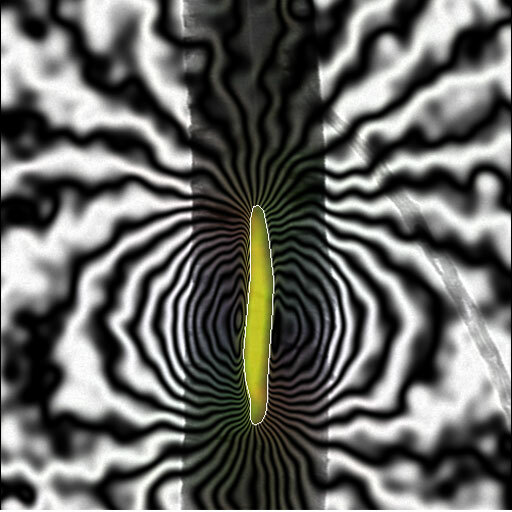 The image on the right shows the magnetic field lines in a single bacterial cell.The fine white lines are the magnetic field lines in the cell, which were measured using off-axis electron holography.Such bacteria live in sediments and bodies of water, and move parallel to geomagnetic field lines as a result of the torque exerted on their magnetosome chains by the earth's magnetic field. 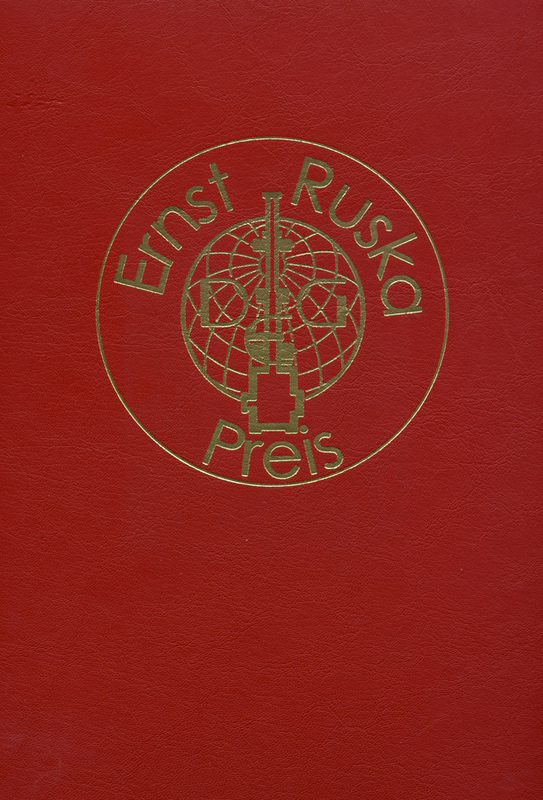 Acknowledgments: Richard Frankel, Mihaly Posfai, Peter Buseck. 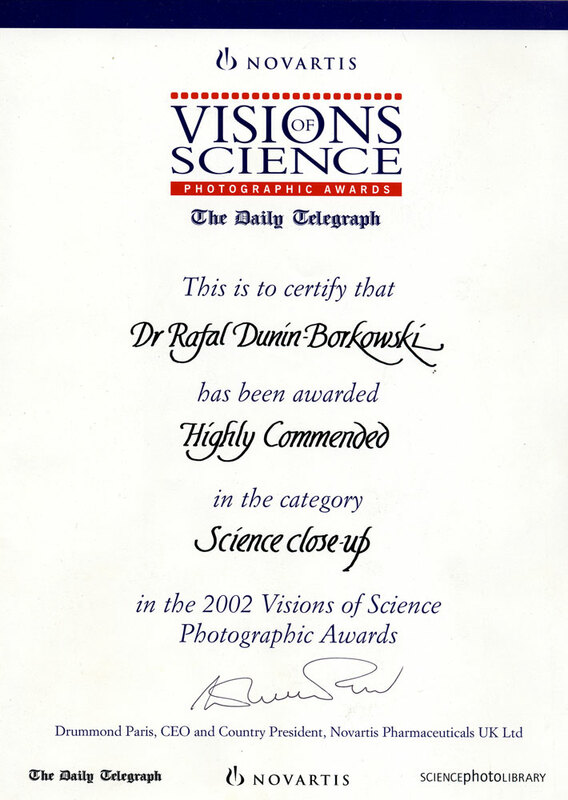 Highly commended entry in the "Science Close-Up" category in the 2001 Daily Telegraph Visions of Science competition, for a micrograph entitled "Crystal in carbon nanotube". 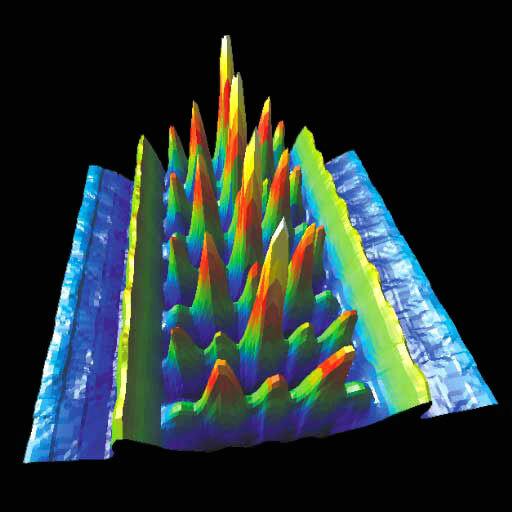 The image on the right shows a surface plot created from a focal series of high-resolution images of a single walled carbon nanotube that contains a single crystal of potassium iodide three atoms wide.The sharp peaks show the regular arrangement of the atoms in the crystal. Acknowledgments: Rudiger Meyer, Jeremy Sloan, Angus Kirkland, John Hutchison. 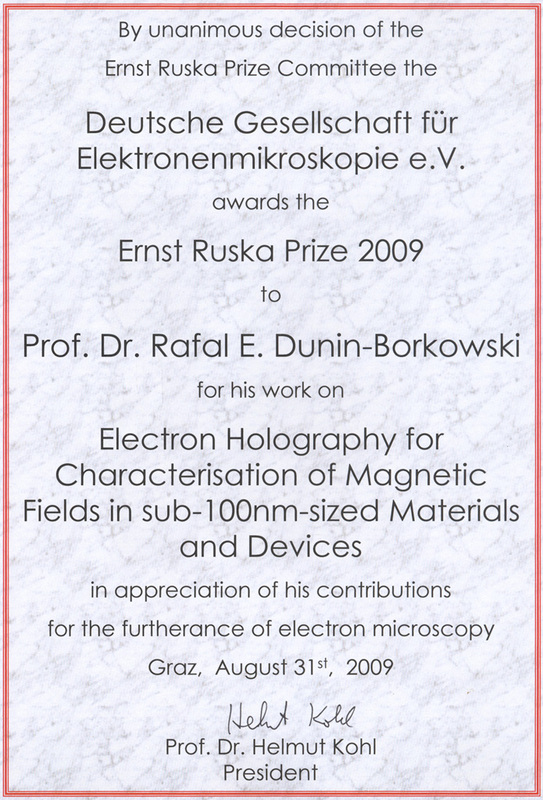 "For his excellent contributions in the field of electron microscopy". EMS (European Microscopy Society) lecturer at the 12th Multinational Congress on Microscopy (MCM2015), Eger, Hungary, 23-28 August 2015. 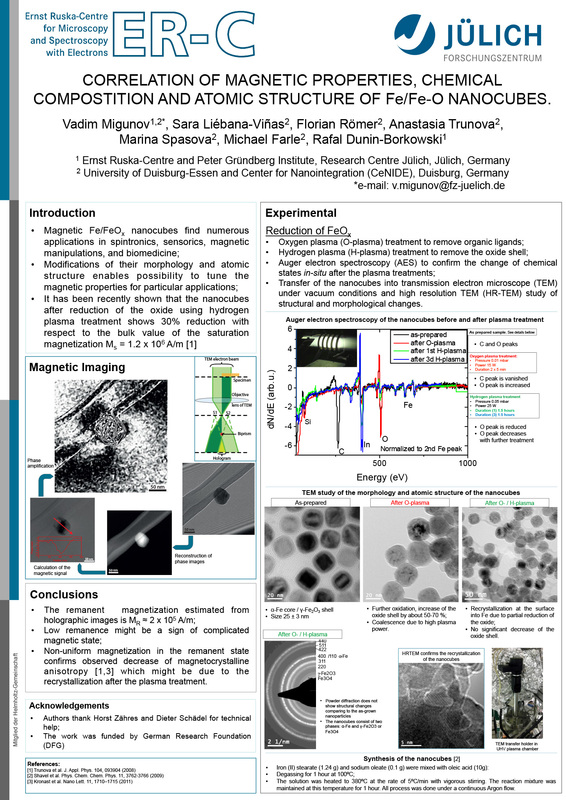 "For international leadership of aberration-corrected electron microscopy for characterization of nanoscale particulate. 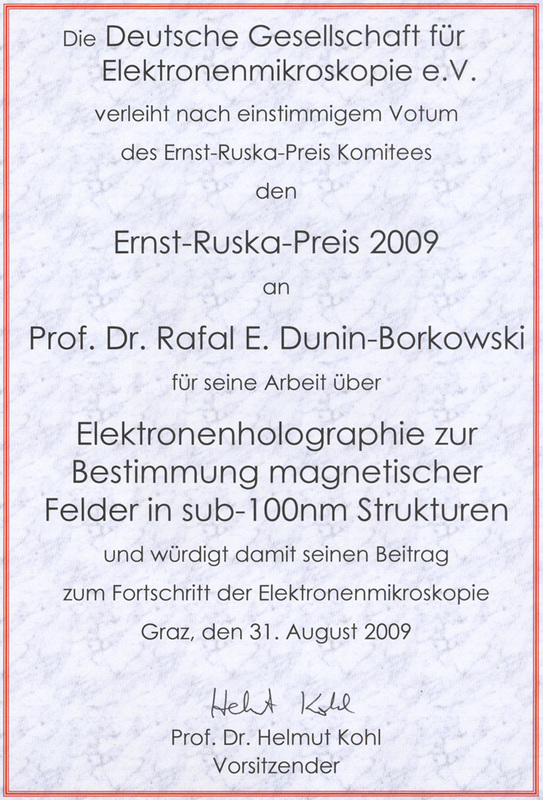 For seminal and highly innovative development of electron holography to permit mapping of magnetic fields and electrostatic potentials". Click here to see a picture from the Award ceremony. 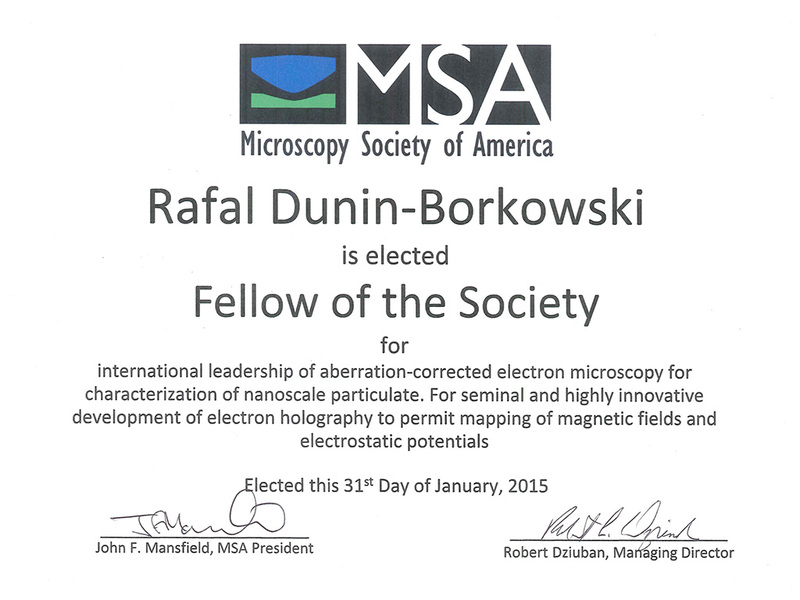 "Imaging magnetism in nanostructures using electron holography" (IMAGINE). "Electron Holography for Characterisation of Magnetic Fields in sub-100nm-sized Materials and Devices". 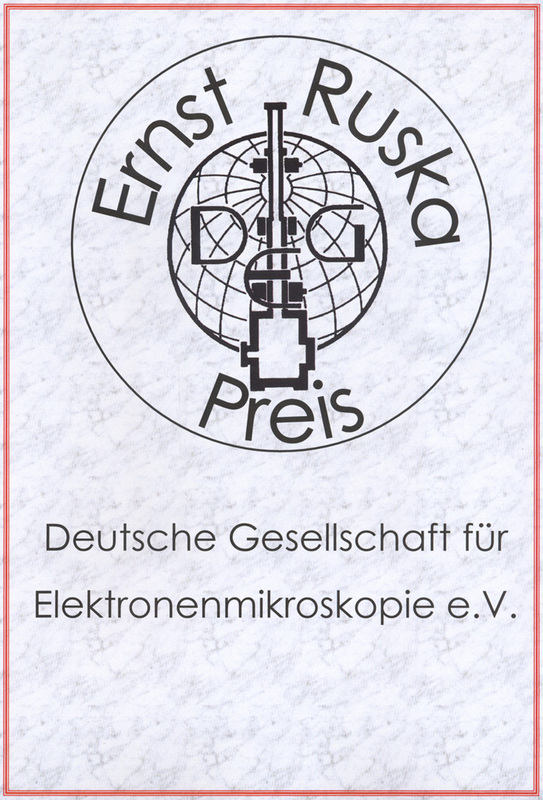 Click here to see the Award page on the website of the German Society for Electron Microscopy. Senior Research Fellowship under Title B, Churchill College, Cambridge, U.K.
Royal Society University Research Fellowship, University of Cambridge, U.K.
Japan Association of Mineralogical Sciences Award awarded to T Kasama. 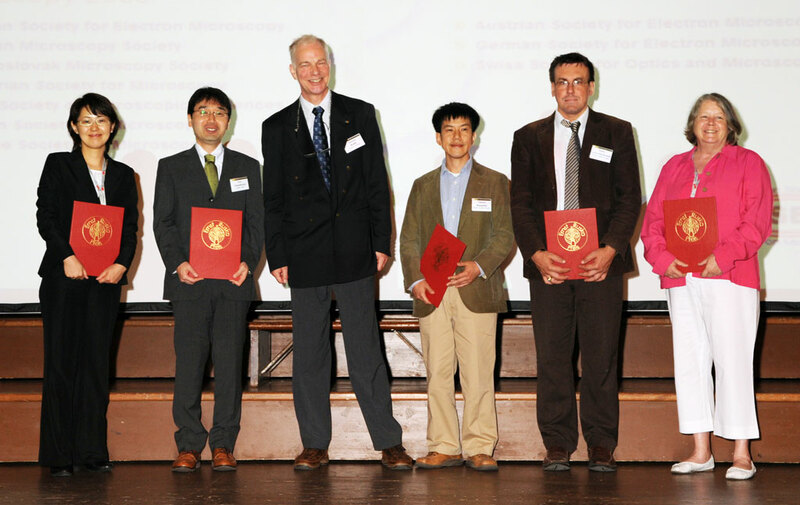 Max Hey Medal of the Mineralogical Society of Great Britain and Ireland, to recognize research of excellence carried out by young workers in the fields of mineralogy, crystallography, petrology or geochemistry, awarded to T Kasama. Mineralogical Society of America Award, "to recognize outstanding published contributions to the science of mineralogy by relatively young individuals or individuals near the beginning of their professional careers", awarded to R J Harrison. 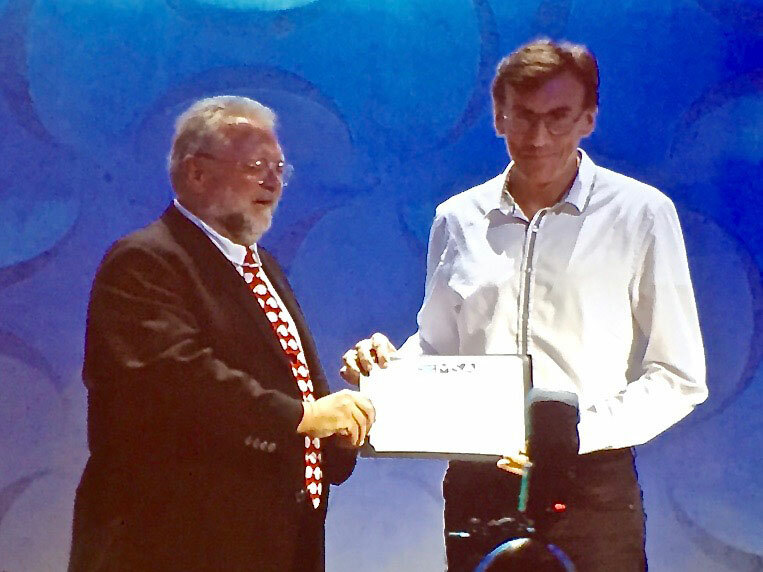 William Gilbert Award of the Geomagnetism and Paleomagnetism section of the American Geophysical Union,"in recognition of outstanding and unselfish work in magnetism of Earth materials and of the Earth and planets", awarded to R J Harrison.